I find myself thinking of quilting and itching to work on something even (or maybe especially) when I can't be at my machine. For those times I am a passenger in a car, on a plane, at lunch during the work day, or watching TV with my family, I have a few go-to projects. Sometimes I work on counted cross-stitch. I learned to do cross-stitch on my ninth birthday and was hooked. I've created several pieces over the years, but don't tend to display them, other than my latest, pictured above. First in my heart, though, is quilting. 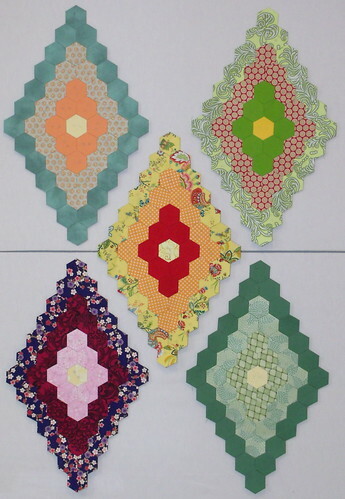 I tried English paper piecing hexagons a couple of years ago. It was good and portable, but didn't fit in my hand very well. That is, it didn't fit until I found the sweet spot - the 1" hexagon. It's perfect! Like Goldilocks, I had to try until I found something just right. Now you can hardly find me without my travel EPP pack close at hand. To try your hand at EPP, first either cut shapes to suit you, or purchase a pack of pre-cuts. I have some card stock on hand and a copier at my disposal, so it was nearly free to run several pages to be cut with scissors. To print your own, go here. You can choose any size you like. Note that hexagon size is the length of each outside edge, not the width. Again, I find 1" absolutely perfect; they're small enough to fit easily in my hand and seem small, but go very quickly. To make it easier to pin them to my 2.5" squares of fabric, I then punched two holes near the center for my pin to snake through. I don't care for the flower shape, but that's a matter of opinion. Some people like it very much. I've made ogees and diamonds, so far. Of course, you're not limited to the hexagon shape. There are tumbling blocks, stars, even curved pieces - your imagination is the only limit! Take your inspiration from architecture, tile, woven work, counted cross stitch, anything at all. 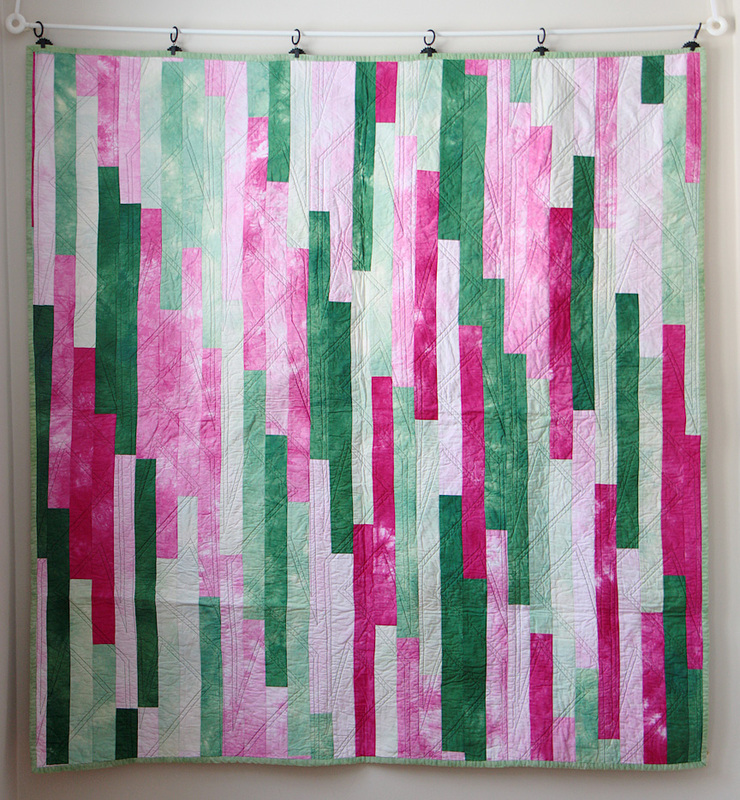 You could make an entire quilt top out of your EPP shapes, or only a few and tack them to a whole-cloth background. For basting, I use whatever I have on hand and need to use up; when I first started quilting, I though "real quilters" only stitched their sandwiches together by hand, so bought several spools of Coats and Clark hand-quilting thread. It is fine for actual quilting, but with EPP, tends to shred, so I'm using it in the basting process, instead. For piecing the basted shapes, however, I switch to high-quality Gutermann 100% cotton hand quilting thread. It comes pre-treated and doesn't shred on me. Time for me to go baste some more! They work. I cut both quilt fabric and heavier fabric with no problem. Are they as good as new Olfa blades? I'm not sure, but for $1.99 for a two pack, I will be buying more. This is only $7.99. I bought this kit for $12 when I took a sewing machine class over two years ago and LOVE it. It works great at getting into the nooks and crannies of my machine and sucking all the dust and fuzz out. It fits onto the hose attachment of all vacuum cleaners (that's what the package says). This is a "must have" in my opinion for anyone who does a lot of sewing. I use these when I'm pinning my quilts. Either I'm old (which I am) or I have delicate knees, because they really hurt unless I'm wearing knee pads. They have a large variety ranging in price from $2.99 to $10.99. These are $5.99 for a three pack. They had a light rubber grip which I think would work great for quilting. At only $2.99, I bought one. I think this would work great when using pins and not near a pin cushion. Also I thought this would work when I drop my needle in the sofa when I'm doing hand sewing and can't find it right away. The magnetic strip would help in grabbing the needle before I find it with my finger...we'll see how that works. Ladies, I thought this bad boy would work great as a sewing machine travel bag. It measures 20" long, 18" wide and 10" deep. It's only $18.99 and has a total of 21 pockets inside and out. It has an adjustable handle, two wheels for pulling and is made out of heavy duty tool bag material. My machine is 12" tall, but if I didn't already have a travel bag, I would load my machine in the car, drive over and see if it fit. I don't know about you, but my hands get dry and cracked in the winter. This was $6.99 and I did not buy any...this time. I know, it's not quilt related, but if you're crafty, can you really ever have too many of these around the house. They're only $1.99 for the variety bag of 10 brushes. Look at how cute and colorful these things are! I have no idea what I'm going to use them for, but they were only $.99 for all six and I LOVE THEM!! Why cow bells? Because you just never know when you're going to need more cow bell, and they're only $3.99! That's my 10 Minute Tip on Cheap Rotary Blades and my new favorite store, Harbor Freight. When I first started quilting I always used a 70/10 Universal needle for piecing, which was economical and worked great for simple patterns. When I started taking on more complicated patterns with smaller pieces, curves and more corners to match I switched to using 70/10 Sharp needles. The sharp needles stitch in a perfectly straight line, allowing for very precise piecing. I've always used an 80/12 Universal for machine quilting. There is a drawback to using Sharp needles, though - I've noticed that some of the quilts I've pieced with 70/10 Sharps are showing more wear around the seams than those I've pieced with 70/10 Universals. Sometimes the Sharp needles actually pierce threads in the fabric, rather than separating and stitching between the fabric threads. After a couple years and dozens of washes the quilts I pieced with Sharps have a few small holes around the seams. Boo! I recently tried a package of Quilting needles from Schmetz - they come in sizes 75/11 and 90/14. I've used the 75/11 for piecing and so far they are working well - they sew in a pretty straight, although not perfectly straight, line and don't pierce the threads of the fabric. I haven't finished the quilt top yet, but when I do I'll try the 90/14 needles for quilting. What kind of needles do you choose for piecing and quilting? I was asked to discuss a super easy quick quilt pattern that could be made for charity. I thought I could chat about the pillowcase style quilt. This is more like a big blanket than a quilt. But, it is quick and easy! The nice thing about it is-- it doesn't need binding! I have linked to a few methods and examples below. 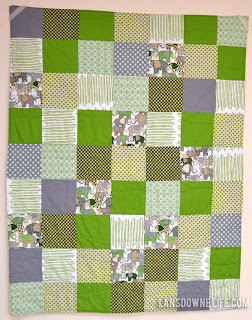 This one is a cute patchwork style tutorial from lansdownelife blog. Though she did the top in patchwork, you could also use one solid piece, similar to a whole-cloth quilt. Listed below are some different instructions for making this style quilt. Yet another example with photos and step-by-step instructions. This one is from bluemoonriver.com's blog http://www.bluemoonriver.com/PillowcaseTurn.pdf. 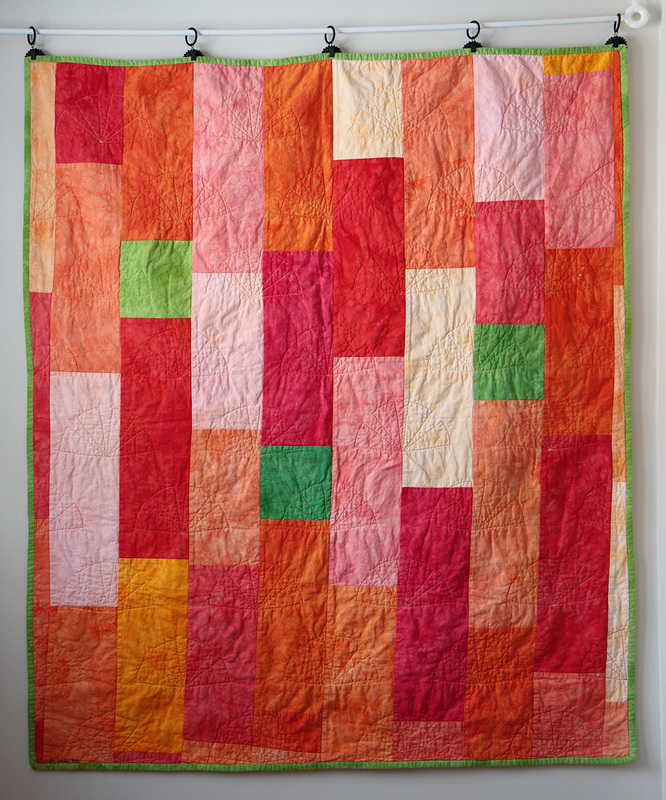 Here is one last tutorial from Rita at Red Pepper quilts, used with permission. 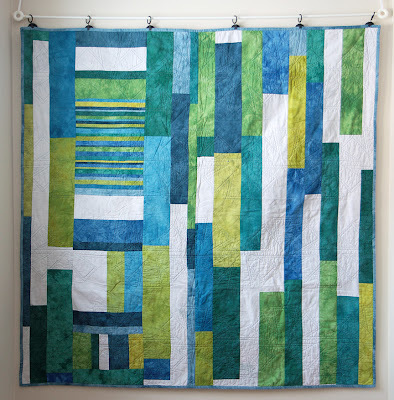 She has a few tutorials for making this style quilt- she refers to them as quilts without binding. http://www.redpepperquilts.com/2011/09/quilt-without-binding-tutorial.html. I encourage you to try this method and have fun! PS Thanks to Kristin for helping find an image and for Jen's one block tut http://minneapolismodernquiltguild.blogspot.com/2013/01/quick-charity-quilt-series-one-block.html for inspiration and ideas! 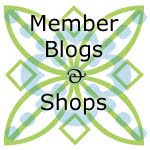 The guild is looking for input on swap ideas for our members to do throughout the year. Of course, being me, I googled it, hoping for a one-stop list of things people do with their quilt guilds, and did not find such a list. So, I’ve gathered a collection here inspired by modern quilt guilds near and far, pinterest, and my own brainstorming. There are so many small projects that can be done and traded in a swap. Mug rugs are popular, and a cute way to use up scraps or try a miniature version of a block. Pincushions, the ever useful (and another great way to use up scraps), and really, can one really have too many pincushions? Name tags. You can swap names ahead of time and make one for someone else. Bag. This is one our guild is doing right now. Sewing space sign. I haven’t actually seen this one out there, but I think it would be fun to make little hanging signs (for door or wall) announcing this space as a quilter’s work area. 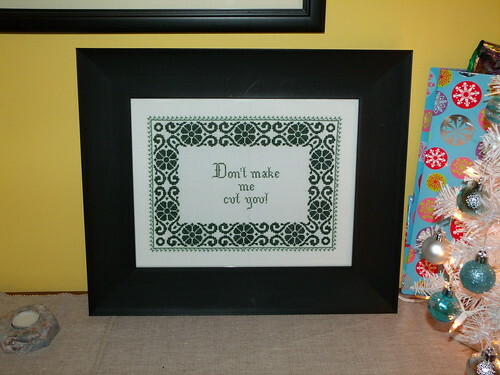 (e.g., “quilter at work, enter at own risk”). Challenge fabric project: guild could buy some yardage of a challenge fabric, and all guild members get a fat quarter (or charm square or something) and do a project with it. Gift bag – make a bag meant to hold a present, swap, and then we all have a nice homemade gift bag to use for someone else! These swaps can still be fun, but don’t have as much time investment ( and can be good if you have lots of other projects going on in your guild that month). Ugliest fat quarter (could always follow up with a project challenge to use it in a project and swap again). One yard of fabric (divided up any way you like or not at all). Fabric scraps (some predetermined weight or baggie full). Charm swaps, bring 5” or 6” square pieces of fabric, and take home the same number. Thanks to the Triad Modern Quilt Guild for this great idea! Favorite color fabric swap. Each person picks their favorite color, everyone trades names at one meeting (with the favorite color) and then get that person a small bundle of fat quarters with that color as the focal color. If you are feeling feisty, you could also do the opposite, and give a bundle of least favorite color (can’t we all benefit from broadening our creative base?). So there it is, the beginnings of a swap list. Happy swapping! 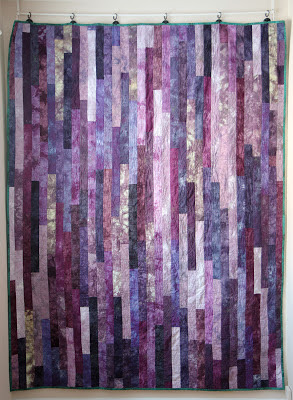 However, I have used this pattern/technique several times to make a pieced backing that uses up lots of scraps. 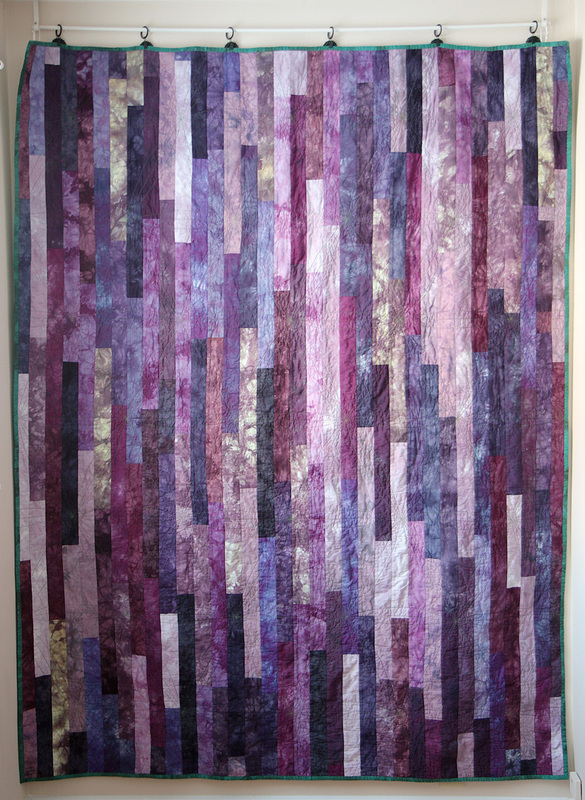 It is the fastest quilt top I know, with the exception of Jen's one block top! The idea is, take a stack of 2.5 inch strips and sew them end to end to make a really, really, long strip. If you use a Jelly roll, this strip will be about 1600 inches long (hence the name) and will make a 50 x 64 inch quilt. Most of the videos and instructions have you sew the strips together diagonally (like when you sew lengths of binding together) to create slashes, but I preferred to just sew them together with flat ends. As a bonus, that also uses less fabric. Using up a giant stack of purple. If you want to see a Jellyroll race, take a look at these instructions and video by Heirloom Creations. And here is another video showing the steps by MissouriQuiltCo. If you are using a Jelly roll, cut off the first 18 inches of one end so the pattern will be random. Then, take the two ends of your long strip, line them up right sides together, and sew them together on the long side. When you get to the end, clip the two halves apart--you are now down to 800 inches. You can wait to press anything until the end. Find the two ends again, place them right sides together again, and sew together on the long side again. This seam will take half as long and then be 400 inches. Make sure that you don't catch the other strips in your new seam. When you are done, cut the two halves apart again. Repeat this 3 more times to get down to 200, 100, and finally 50 inches wide. For the last three doublings, make sure that you are putting the ends right side together without twisting the strip. When you are done, you can add a border if you want to make the quilt a little bigger. While the instructions for this technique call for a Jelly roll, don't feel like you need to use one. I used 2.5 inch strips from my stash, and most of them were nowhere near 40 inches long. I have also done this technique with fatter strips, and that is even faster! I made one quilt back with about 4 inch strips, and one with varying sizes of strips (and a little bit of leftover strip set from the front). Using up scraps from the front. Using up scraps and chunks from the front. Take the length of the quilt you want to make, in this case 90, and divide it by the finished width of the strips (2 inches). 90 ÷ 2 = 45. This is how many rows of strips you are going to need. Then, you multiply 45 rows by the width (72) to get the total length of the strip you need after the strips are sewn together into the giant strip. 45 x 72 = 3240. Add a generous fudge factor of at least 2 inches per row because the rows will be a little crooked and you will need to square them off. That gives you an estimate of about 3476 inches total. This would be kind of unpleasant to measure out--I usually fold the giant strip into 8 or 16 and then measure and multiply the length out to give a me a rough estimate. Also, you might want to have on hand another strip about 2 x the width of the quilt if your seams tend to be too big or your blocks too small to add on at the end. Now, you may or may not have noticed that the first quilt doubled neatly 5 times to make 64 inches in length, whereas this one does not neatly double in the last step to make the perfect length. There is a way to fix that. 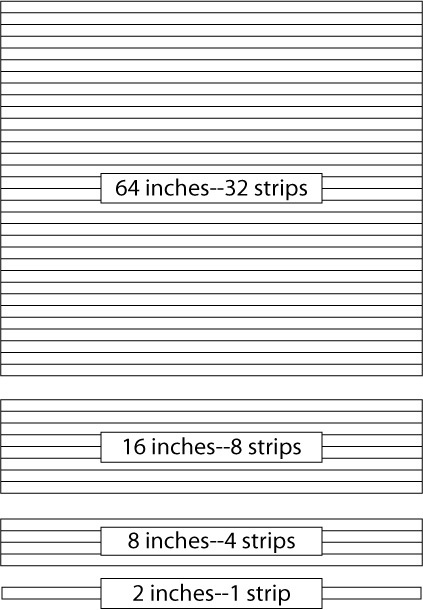 At each stage of the doubling, your strips will be about 2, 4, 8, 16, 32, and 64 inches tall, corresponding to 1, 2, 4, 8, 16, and 32 strips sewn together. Subtract the last doubling length, 64, from the length of your quilt: 90 - 64 = 26. This is how much more length you will need to add at the end. 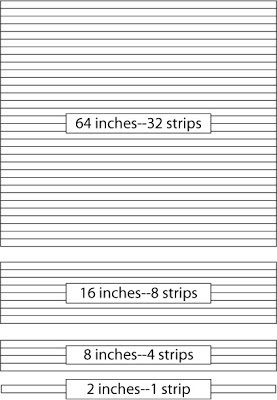 Looking at the various lengths that the strips you keep doubling will be, we could take chunks that measure 16, 8, and 2 inches to add up to 26 inches. So, to get 26 more inches, cut a 74 inch (72-inch + fudge) chunk from your long strip before you start sewing when it is 2 inches/1 strip wide. Double your strip twice, then cut another chunk when it is 8 inches/4 strips wide. Double once more, and cut off one last chunk when it is 16 inches/8 strips wide. Set these chunks aside and double your strips twice more to get to 64 inches long. Then, sew the chunks you set aside onto one or both ends of the quilt and you are done! 64 + 16 + 8 + 2 = 90. Here is a handy chart to tell you approximately how to make a particular size.